Music ‘plays’ with you – humming through you and your day. Music ‘plays’ with you, in songs, symphonies and streamings. Music ‘plays’ with you in pure fun. 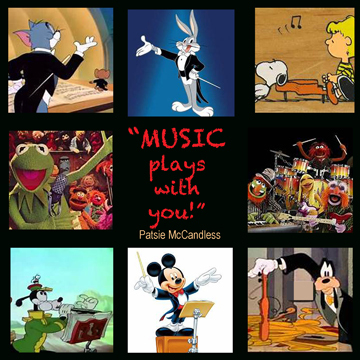 The image series I used for this Music Quote illustrates just one way that music shapes our enjoyment: in the cartoon figures of a rascally rabbit, a sincere frog and his companions, a piano-playing boy and his wise little dog, a cat-and-mouse game that never ends, and a world re-knowned mouse and his dog. From Rossini Overtures like ‘William Tell’, to Liszt’s ‘Hungarian Rhapsodies’, and Brahms ‘Hungarian Dances’, cartoons – and we – never had it so good! Play on!